Oliver and Spike is an adventure, platform game and exploration puzzler mix which combines elements of traditional adventure games with platform game-play. Think Ratchet&Clank meets Zelda meets Uncharted! We follow Oliver and his trusty friend Spike, a small British Bull Terrier, on their quest to uncover the past and save the future. Sounds very generic? Well it's not! 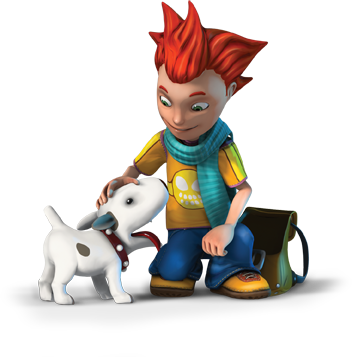 Unlike a traditional exploration and adventure game, Oliver&Spike features unique Dimension Jumping game-play. The Game will be available for Consoles, PC and Mac with additional companion games for iOS, Android and web depending on funding. Each world (called Clusters) consists of at least three alternate Dimensions which need to be switched to in order to get ahead in the main quest-line. These Dimensions have the same basic shape but are otherwise very different. The Firma Dimension, for example, enables Oliver to bounce and jump higher, while the Aqual Dimension is submerged in water. With Oliver's special ability, he can switch to available Dimensions at any given time if a few pre-requisites are met. These Dimensions however don't just serve as a fast go to point to get along on the main world. The alternate Dimensions have their own look and feel and characters with side quests, collectibles and secrets to uncover and explore. While you can fast switch to the Aqual Dimension to swim up to an otherwise inaccessible ledge, you will on top of this encounter its quirky and fun inhabitants. Read more about Dimension Jumping HERE. There will be areas were Oliver and Spike can be controlled by different players and areas might only be accessible thanks to team-play. In an older development video on our development blog you can see how Spike is distracting a vicious plant in order for Oliver to climb past and push the log down which in turn enables Spike to progress to the other side. While the focus of the game is to make sure it can be played alone, we are trying to implement as much game-play as possible which is playable in co-op mode with friends or family members. We won't block you from progressing through the game though, co-op will not be a necessity and fully optional. We want to share the Oliver & Spike story on multiple platforms. For us, that doesn't mean just porting the core game from Console to PC or Mac but instead use the advantages of each platform to give you a fun and exciting overall experience. This means companion games on smartphones, or social games on Facebook. These mini games will further immerse you into the world of Oliver& Spike, explain about characters and give your more insight on the actual story-line. We do have that knowledge in house and a very experienced team. It would be a waste on our part to not use this potential when it comes to different platforms. It also presents a unique opportunity for further immersive storytelling. We are also researching if a link between console builds and social media is possible. 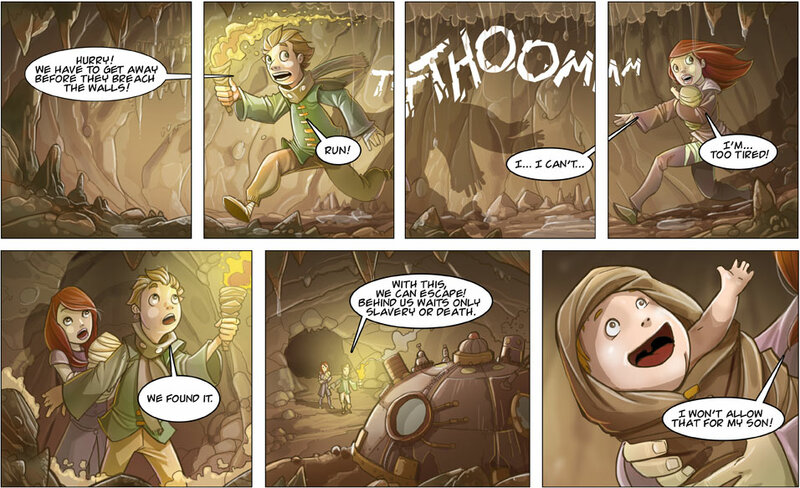 Comic panels are also part of explaining what happened before the player starts the game. Our goal is to also create a line of comics and ideally even animated movie series to tell the story about all these beautifully designed worlds we designed. We have been a bit quiet haven't we? Totally sorry about that! Lots of projects flying around here at the office and as always, we have the Rockpocketeers work on all different kind of games. We are working on adding the additional game-play mechanics we haven't shown before and get them ready for GDC 2013 in San Francisco. Arnleif has been working on camera related issues and other fun bits here and there. For example, we are making sure if you move the camera it won't get stuck or intersect with props. Believe me when I say you get some really freaky looking views with a buggy camera code. 3D model eyes do NOT look funny from within the skull..not even if it's a Waba! A lot of polish has also been done by him in regards to Oliver carrying or interacting with props, as well as Oliver reacting and looking at items close by by turning his head. Small fluff things like this make the world and the game feel more alive, at least that's what we believe. Before Christmas he also fleshed out the actual boss fight you'll be able to try your hands on in San Francisco. Tastes like chicken! Lill has been working on additional animations for Oliver, such as throwing, rolling and carrying different quest objectives. This asked for some special attention since the different dimensions influence Oliver's animations in different ways (just think of Aqual which is under water compared to Firma with lower gravity). Quite a bit of a challenge there but also a lot of fun. He also added proper facial expressions for Oliver which are triggered during game-play and is now moving over to fleshing out proper fighting animations. Yup, even though Oliver&Spike is an Adventure Game with Puzzle and Platform elements, there is also some fighting involved (other than the actual boss fights). However, fights with actual creatures in the world can be avoided if that's not your thing. It's all up to you really. We have a lot for you to try out should you attend GDC and visit us for a test run. Trond has been filing on the fighting animations and the responsiveness coding wise - no easy task to make it not only look but also feel good while playing. Henning is now polishing up the QTE cut-scenes and adding them to the actual Unity Scenes for further use to actually get it ready within the game mechanics. As mentioned: should you happen to be at GDC in San Francisco make sure to come by and say hi (more on that topic later!). Never a dull moment with Dimension Switching! This looks very nice and original in both graphics and gameplay,can't wait to see the final result of the game. I wonder how much work it takes to create a specific area with different dimensions. Are the environment objects (animals, plants) hand-placed or is there some kind of function behind it? All the dimensions are built manually and every object placed by hand. Just joined IndieDB with my own team, and this is inspiring! Keep up the great job!